Supple aromas of black currant and cherry mingle with inviting oak and mocha notes. A smooth entry flows into a balanced acidity of fine-grained tannins and a solid structure. Well-integrated flavors of dark-skinned fruit, black cherry, baking spices, black pepper and toasty vanillin oak fill the palate. Traces of cocoa, eucalyptus and mocha tuck nicely into the background, becoming more pronounced as the finish lingers. This easy-sipping Cabernet pairs seamlessly with any heartier cuisine. Try it with your favorite steak, lamb stew or a Monday night meatloaf. 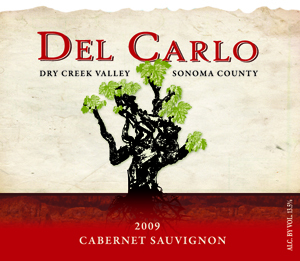 Our 2009 Cabernet Sauvignon is produced from grapes grown on our Home Ranch in the heart of Dry Creek Valley. The vines are located near the foothills on the eastern side of the Dry Creek bench. The elevated terrain and well-drained rocky, clay loam stresses the vines just enough to limit yields and create small concentrated berries. These small grape clusters—resembling blueberries in size and color—create intense wine with concentrated, delicious flavors and a solid structure. Aging for 18 months in French oak barrels, followed by additional bottle aging, allows the intense flavors and firm structure to marry and mellow. The result is a smooth, rich, food-friendly Cabernet Sauvignon to share with family and friends.